Last week, we took a 3 hour trip to fetch a newly freshened dairy cow to add to our Guernsey herd. 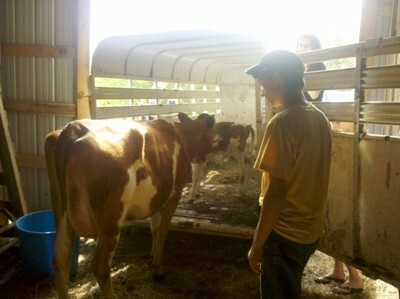 On our way, we also stopped by a Guernsey Dairy Farm and picked up a newborn bull calf. The trip went smoothly. Everyone watched giddy and excited as we loaded her up. She handled the ride in the trailer very well. We allowed her some time to settle down in the trailer when we arrived home. 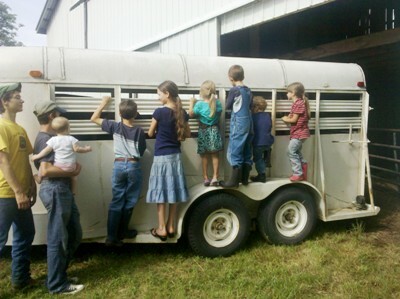 From past experience, we haven’t always fared well when we open up the trailer door immediately after a long trip. Imagine a 1,200 pound animal busting out of the trailer, plowing through your pasture fence and dragging the trailer and truck behind her never to be seen again….well, not exactly…. but sorta similar. So we let her settle. She walked into the trailer without problems, maybe she would just walk out of the trailer instead of bolting out like a wild animal. We were holding our breath and were very happy when she just walked out! So far, so good! No one got hurt. Everything was new and different and that is something that dairy cows hate! Dairy cows are creatures of routine and it takes a while for them to settle when you’ve disrupted their routine. She smelled around while the rest of the farm animals stood at the fence and stared and gawked and talked bad about the new comer. Animals, like some people, are very judgemental. We are finally establishing routine. She is now letting the new calf nurse off her when she is in the stanchion at milking time. She doesn’t like him but she tolerates him. She’s easy to milk and gives a good amount of tasty, golden milk. She’ll be part of our dairy cow share program here on our farm. We are thrilled to add her to our farm and look forward to working with this amazing animal. We had a similar experience a couple of weeks ago with feeder steers. We brought home five on Sat, Mike left for a trip. Sunday all were gone. A bunch of men from church helped us get back four. But it seems as though number five may be gone forever. You live and learn I guess. Several peaople said don’t you know you have to let them settle in a round pen a few days. HmMMM If we knew that things might be different now.